Please be aware that a member of our school community has a severe allergy to tree nuts. Even though all of our schools are nut-safe, we sometimes let our guard down or forget that members of our school community have life-threatening allergies. The specific allergy in this case is to tree nuts. A snack package that has the symbol linked to this news item does not mean that the product is free from all nuts. 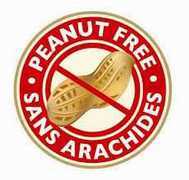 This symbol tells you that the product is “peanut free”. It may still contain tree nuts like hazelnuts and pecans. The “peanut free” product may also read manufactured/processed in a plant that processes “tree nuts” on the label because the item is “peanut” free and not free of “tree nut”. This is particularly relevant to students whose allergies cause an an anaphylactic reaction. This is a life-threatening reaction. Please ensure you read the label carefully when sending in a snack for your child to ensure that it is “peanut and tree nut free”. The peanut free symbol alone does not guarantee the product is free of both peanut and tree nut unless it has the following symbols. It is important to continue to educate our school community as policies and products continue to change as well as labelling information. Parents are asked to eliminate allergens packed in lunches and snacks. Nuts or nut bi-products are to be strictly avoided throughout the school. Students will be asked to continue to be vigilant and to refrain from bringing in nut products. The Allergy Safe School Plan will be sent home to all families in September and consists of a variety of educational practices and awareness procedures which are focused on helping our community to provide knowledgeable and caring support for our members with allergies. Thank you for working together to make our school an “Allergy Safe” environment.